First off, I cannot begin to express how grateful I am for Carl Zimba. Every time I have had to miss a day of Frostbiting, he has been there for me. And somehow every single one of those days manages to be extra cold and extra miserable and extra windy and whatever else nature can throw at him. So thank you Carl, and of course the rest of the Frostbite Team for being there. It was nice to get away for a bit, but I am happy to be back with you. I wanted to share Carl's notes with you from a very chilly Week 7. ***Day 7 of Frostbiting was cold and windy although the strong sunshine may it bearable. Winds were stronger than forecast, shifting northward (to the right) as the day went on. With the wind shift, the tidal current became more aligned with the course. Overall, it was a day where nearly everyone had a difficult race and so finishing consistently in the top half of the fleet led to success. Race 1 was a solid start with one individual recall near the committee boat. During the race, one boat opted to drop out to reef their main. Another boat missed the start since they were pumping water from their hull. [If there is a lot of water in your boat on the dock, please let us know. We have electric pumps that we can use to help you.] Race 2 started with a general recall and a restart under the I flag. With the current pushing everyone toward the start line, the I flag was used for the remaining 4 races. Race 3 was shortened to a single lap due to the out-going car carrier. Right after the car carrier passed, a set of strong gusts moved through that gave RC some pause about potentially reefing, but the wind settled back down. 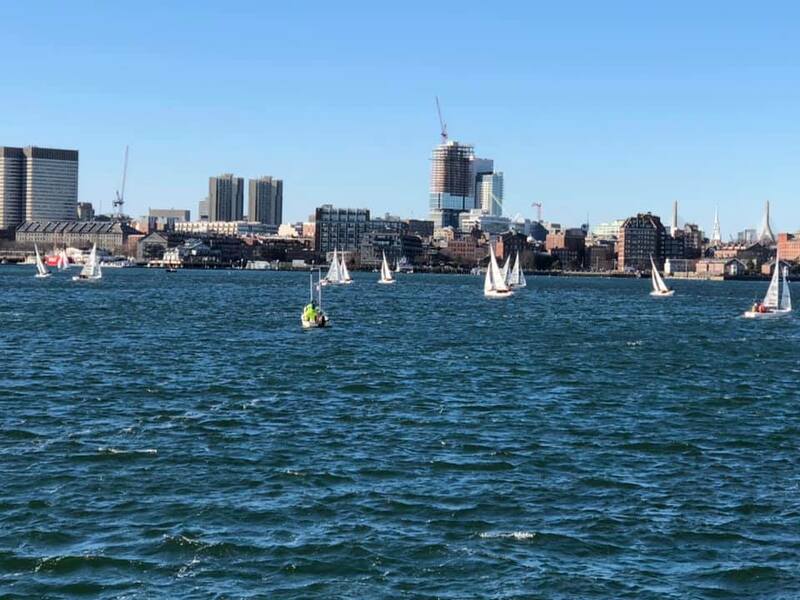 One thing that I noticed with boats sailing on port tack shortly after the start is that there was a tendency to sail to the right-hand side of the course as close to the piers on East Boston as possible. While this allowed them to sail longer legs before tacking, it also took them out of the favorable current that the boats in the center and left-hand side of the course were experiencing. Thank you again Carl for all your excellent work!